Every week Ruth Ayers invites bloggers to celebrate their week by focusing on about the big and the small things worth holding up and celebrating. Thank you Ruth for this lovely ritual. Read more celebrations here. Today I celebrate the time and space created by summer. As a teacher, the school year is very time driven. We eek all we can out of every minute. And we get a lot done. But with that pressure, that efficiency, we loose a bit of mind space that allows for possibility and growth. Today I celebrate all that can go with the extra time and space that summer allows. 1. Conversations. In the hurry of the school year, I maintain friendships with a text, a wave, a promise to get together, but in the end, while I mean to take the time, I often can’t or maybe just don’t. I say, next week, tomorrow. All of a sudden, time has slipped by and it hasn’t happened. With a little less schedule, I stop and talk. Today I celebrate two long conversations and how the ebb and flow, the back and forth that goes with it can move your thinking and lift your heart. 2. My desk. I’m one of those teachers who cleans up their classroom and brings a lot home. Because I need to read it, organize it, cull through it, re think it in a thoughtful manner. The upshot of this is that my desk, in the corner of my bedroom, is inundated with charts, books, papers, more books, files, stacks and stacks of things to go through. Yesterday I went through my stacks of papers, took pictures of charts, filed, tossed and so today, I can celebrate my desk. You can see the color of it! 3. Projects Completed. This desk space was only possible after I finished a few school related “projects.” All were opportunities to interact with other teachers, to do things I love, but the prep took mind space, leaving no energy or time to clean up. I moved from one project to the next, telling myself, when it is done then I’ll organize, make dinner on time, shop before 6 pm. I promised myself, my workspace would move to one spot of our house rather than the living room, the dining room and sometimes the kitchen. Today I celebrate the completion of these projects and the space that finishing creates. 4. Reading. Reading takes on a different persona in the summer. I read during the school year, but my summer mindset changes how I understand things. In the summer, I see things that could be. I can see how certain things apply beyond the moment I’m in because there is no particular moment I’m in. It’s time to fall in love with reading again. Today I celebrate the time and space created for reading and the thinking that goes with it. 5. My family all in one spot, at the same time. Everyone is scattered and schedules seem to never align. But this weekend, the amazing will happen and (because school is out) all will be together at one time. Today, I celebrate that rare occurrence. Love the pic of your desk. Read Write Teach is on my desk too! We’re putting together a summer book group. Want to join us? Reading and family will have my time and attention now that school is over. I packed everything in my classroom and took only a pile of books home. I like when people share their work spaces. Your desktop is wide and it looks happy. What a lovely work space!! (I, too, have Read Write Teach on my desk.) Time….I love how you celebrate time. I completely agree. Summer is when I can breathe and relish in conversations and reflect more. Thanks for great celebrations, as always! I especially like your last one- family. Enjoy. I too have Read Write Teach nearby, ready to read this summer. I see that our posts are very similar this week. Soooo much to celebrate about summer! Enjoy! There’s nothing more rewarding and inspiring than a well-organized desk! I really need to clean mine up! Have a great week! Congratulations on that lovely feeling of organization.Savour it! Enjoy your family and your time to read. 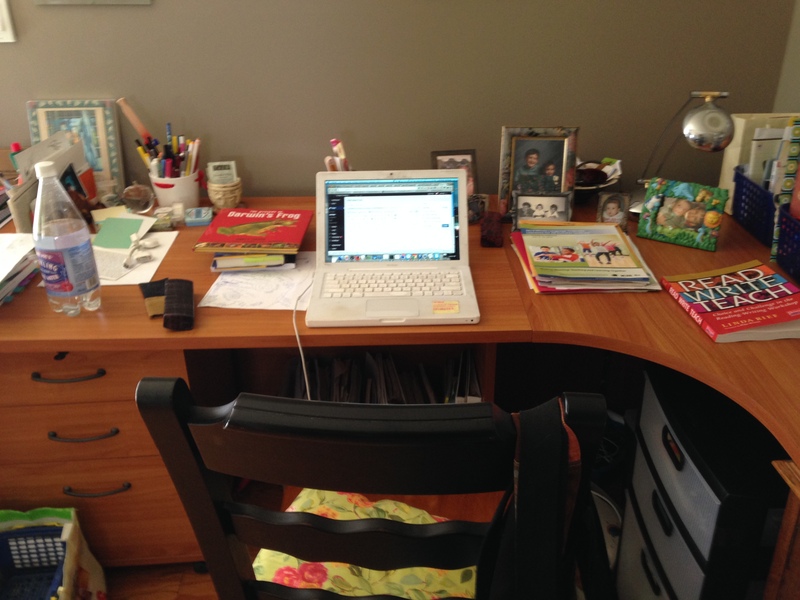 Your desk looks great, Julieanne. I enjoy the time for more thoughtfulness in the summer, too. Thanks for the reminder! I love the “everyone together at one time” moments! Enjoyed reading your celebrations! Great moments of organizing and more! Summer does have a way of clearing the mind, only to refill it again! I also celebrated the first day of summer. I feel like this was my first day although we have have been out of school since May 23rd! Enjoy your time with your clean desk, your books, your conversations, and your family!